I have a few, very faint, stretch-marks across my hips and I’m guessing that I’ve had these since my teens. They’re only apparent when my skin is more tanned, so they don’t really bother me too much, but I know that stretch-marks are a huge issue for women and younger girls. People get them regardless of whether they have had children or not, and I’ve had girls as young as twelve writing in asking for possible remedies. As with most beauty conundrums, prevention seems to be the best cure. Regularly using a good quality oil or cream and massaging it in to keep skin supple is probably the single best step that you can take to prevent marks from appearing and stop existing stretch-marks from worsening. There are hundreds of different oils available, some highly-fragranced, some very simple. My Mum has always used a basic sweet almond oil from her local chemist (a few pounds for a large bottle) but then I have a friend with three kids and the most amazing skin who uses a very fine and expensive Rosehip Oil on her tummy, hips and thighs! 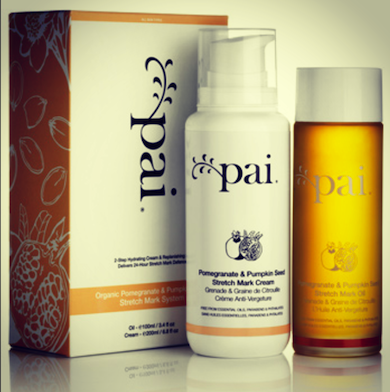 Pai’s new Pomegranate & Pumpkin Seed stretch mark system is brilliantly straightforward; a cream for the morning and an oil for bedtime, and it’s 100% essential-oil free for those pregnant ladies who want to keep things as unscented and gentle as possible. The cream is rich, non-sticky and nicely soothing, the oil is thick and feels deeply nourishing. Between them, they provide the full range of Essential Fatty Acids to keep the skin supple and to aid skin cell regeneration, which ultimately will help to fade existing marks. A nice, gentle regime for Mums-to-Be and New Mums with delicate, sensitised skin, I think. Great, obviously, for anyone who wants effective products without any added synthetic ingredients or controversial chemicals. You can find the full ingredients list (nothing hidden) here. I have a little tip, too: mixing a small amount of the oil in with the cream seems to create this “supercharged” formula, so if you didn’t feel as though the cream was enough on its own, or you prefer the texture of a cream over pure oil, you can do a little bit of customised blending! Also, warming the oil between your palms before massaging makes it go a long way. Remember, you’re only using this duo as a targeted treatment on affected areas, so it should last you a good while. Next Post TWO Magazine by Pixiwoo!